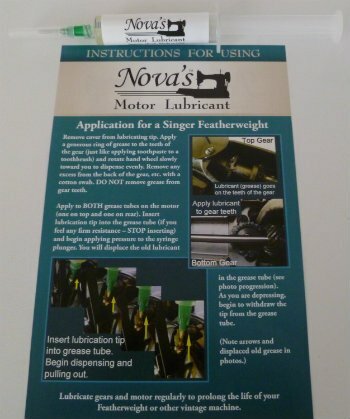 Nova's Motor Lubricant - an excellent choice for lubricating your Singer Featherweight 221 or other vintage Singer machine with grease tubes and metal gears. Intended only for home users for lubricating sewing machine motors with grease tubes/wells and sewing machine metal gears. Nova invested three years in scientific research (with a chemist and research lab) and development of this product. Research was done exclusively on the 110 volt motor. She wants to keep these machines sewing! You will not find this product from any other source. Don't be fooled by imitators! Nova leads the industry in research and development. For more information about Nova's Motor Lubricant and why it was developed -- see the Featherweight Tip of the Month from late August 2014. This was a Special Tip of the Month discussing lubricants and application to your Singer Featherweight 221 . Click here to be directed to that page. CAUTION!! NEVER PUT NOVA'S MOTOR LUBRICANT OR ANYTHING ELSE IN THE TUBE WHERE THE MOTOR BRUSH IS. Don't jeopardize your motor with a counterfeit lubricant. Video below is a demonstration of applying Nova's Motor Lubricant to a Singer Featherweight. NOTE: SOME "white" (mint or celery green) Singer Featherweights have sealed motors and will not need any lubricant. "White" Singer Featherweights (221 K 7's) have no gears - they are driven by an interior belt. 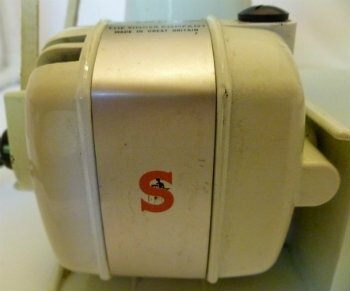 Here is a photo of a sealed motor, so you can tell. See on the right hand side, where the grease port should be, it is sealed up - no grease port. Thank you so much for your help with my denim needle question. And the 221, relubricated with your motor/gear grease, runs like a charm.